We recently upgraded our boiler to a high-efficiency modulating/condensing Triangle Tube Prestige Trimax Solo, and in perusing the manual, I found that the boiler has a ModBus interface . Woohoo, project! The final result is live charting like you see above; for more details, read on! The adapter only has A and B connections, and no GND, but it works fine. I used a twisted pair from a CAT5 cable to connect to the A and B terminals on the boiler, plugged it into a spare Raspberry Pi, and was ready to test this thing. Ok! So to get the pretty graph above, I obviously needed some data collection; for this I used collectd simply because it already had a ModBus plugin. It did require some patching and hacking though; the non-bloggy details are on this page; the graph you see above was made by Visage. Overall this has been very useful; the boiler controls are fairly involved, but primarily we want to get the outdoor reset curve tweaked so that we get nice long runtimes and low return temps, which keep the boiler in its most efficient condensing mode. My installer hit the default buttons and left, as contractors often do. Seeing how the boiler was working over time definitely helped me tweak things to improve performance, efficiency and comfort. Primarily, I drastically lowered the high end of the outdoor reset curve which defaulted to 170F For cast iron radiators, because we have much more radiation in this house than it needs at 170F output. I currently have the high end set to 140F. I may do another post on all that later… suffice it to say, doing a heat loss and measuring radiation and using that information to guide boiler setup is not rocket science, and you really need to do it for the sake of comfort and efficiency. collectd, at least with the rrd output, doesn’t keep fine-grained data around for long. The current setup is useful for seeing how things behaved in the past couple days, but I’ll probably start logging fine-grained data to a database at some point, and can start doing fun things like using the firing rate to estimate gas usage over the month, look at therms per heating degree days in near real time, etc. Other boilers have ModBus interfaces as well; in particular Lochinvar and NTI both mention the capability, although I haven’t yet found documentation on what data is available. 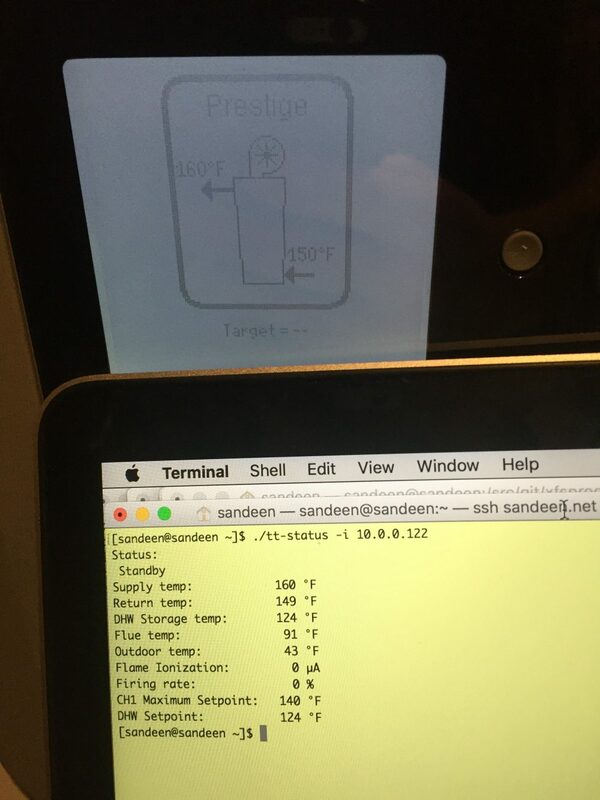 If you have a boiler with ModBus and want to try this hack, drop me a line – I’d love to see how this looks in other homes, and I’d be glad to help you set up a collectd config file. I may see about creating a Raspberry Pi image to make this all more or less work out of the box. Again, take a look at the the more detailed writeup for a bit more info, in particular the patches I used with the upstream tools, and if you try this at home & make it work, share what you find! This entry was posted in Energy, Monitoring by Eric Sandeen. Bookmark the permalink. Hey this looks promising! I have that same boiler and want to use more of the built in functions such as this… later on the exported information would be so nice to monitor. Also, I will be adding a wood boiler in parallel (ideally the gas source being backup only), so I wonder if somehow using the logic in the Trimax control could export and inform the pumps and relays on the wood side to mimic the precision of the gas boiler without having to buy and install redundant controls…? I don’t know for sure that you could use the Trimax controls in the other direction, i.e. to inform a wood boiler, but take a look at the control supplement and see what you think. I’d like to try this but my boiler does not currently support modbus. It’s a Weil-McLain HE II and the control board is a Gold GV Model 1013-200. Any suggestions on a control board I could swap in that would support modbus readout? Hey Adam – I know very little about other boilers, sorry. My old boiler was a Weil Mclain, though – super basic, no smarts at all, and I set up an Electric Imp with LM75 temp sensors to do some data logging of supply and return temperatures. Not quite as slick, but it was still interesting. I too have an older boiler. Can you give details on your electric imp setup? Cost, sample results, etc? I didn’t find the results to be super compelling, but then I wasn’t graphing them terribly nicely. It certainly can show you supply & return temps, and give you an idea of when the boiler is running. An Imp costs about $25, a breakout board is around $13, lm75 sensors about $1 each. You could also use 1-wire sensors; a pack of 5 DS18b20 is about $8 on Amazon. Other than that I just used an old USB charger for a power supply and some spare perf-board and wire to get it all rigged together. The error happens using the same USB-> RS485 adapter you used at /dev/ttyUSB0 and also a RaspiComm that appears as /dev/ttyRPC0. For development purposes I’m using a modbus slave simulator program on Windows instead of the actual boiler. Maybe that’s the problem? I assume that it must be the simulator that’s the problem; I don’t know how you set it up and define the available registers, but that might be the problem. There are at least 2 modbus register types, input and holding. Perhaps you need to be sure the simulator is set up so that address 0 is an input register? I’m thinking it might be related to the simulator too. I’m monitoring the raw serial data at the moment. You can see here I run tt-status 13 times before it finally responds on the 000015 line. I have no idea why the receive packets are coming through differently on lines 0 thrugh 14. It turns out that it was indeed just a terrible emulator. I downloaded a trial of WinModBus and it’s working perfectly. Now to configure the collectd values and post them to my web server. Thanks for the work you put into this. Modbus plugin: Creating new Modbus/TCP object failed. Modbus plugin: mb_init_connection ([hostname]/) failed. It’s looking for a TCP target, but it sounds like you don’t have that. That ttyRPC0 is the Raspicomm serial interface. I’ve tried it with the same USB to RS485 device you used at ttyUSB0. Both physical devices throw the same error. Yes, those debs should have both patches IIRC. Can you talk directly to /dev/ttyRPC0 with the tt-status utility? BTW, I’m using WinModMBus to watch the modbus serial traffic and emulate the boiler’s registers. Very cool program. Just an update: I was thinking that maybe the version of Rasbian that I’m using on the RPI may have updated/overwritten the modbus colletcd plugin from your patched debs. So I uninstalled all packages related to collectd and then reinstalled your debs. Still having the same problem. I think the next step is to try to install collectd from source and apply your patches manually. Think that makes sense? Btw, I see your patches will be included in the next release of collectd. Nice! I’ve done a little more debugging on this issue. Not sure what’s causing host->conntype to be set as MBCONN_TCP. Oops didn’t mean to post so soon. If I remove the Baudrate line then it will throw the error for “No serial baudrate has been specified” while parsing the config file. So at least at that point it’s thinking we have a MBCONN_RTU. For some reason mb_init_connection is following the logic for host >conntype == MBCONN_TCP instead of the else block. Still haven’t figured out why. If I use the ordering of your suggested additions modbus.conf. (data nodes first followed by the Host section) This is what the error log looks like on a colelctd service restart. Note it throws an error for each Data section. [2015-04-09 13:04:14] collectd: Stopping 5 read threads. [2015-04-09 13:04:14] collectd: Stopping 5 write threads. [2015-04-09 13:04:16] Modbus plugin: Creating new Modbus/TCP object failed. [2015-04-09 13:04:16] Modbus plugin: mb_init_connection (localhost/) failed. [2015-04-09 13:04:16] read-function of plugin `modbus-localhost’ failed. Will suspend it for 120.000 seconds. [2015-04-09 13:04:16] Initialization complete, entering read-loop. [2015-04-09 13:12:39] collectd: Stopping 5 read threads. [2015-04-09 13:12:39] collectd: Stopping 5 write threads. [2015-04-09 13:12:41] read-function of plugin `modbus-localhost’ failed. Will suspend it for 120.000 seconds. [2015-04-09 13:12:41] Initialization complete, entering read-loop. # Config file for collectd(1). # Some plugins need additional configuration and are disabled by default. # Please read collectd.conf(5) for details. # before enabling any more plugins. # is recommended for servers handling a high volume of traffic. # Note – setpoint is “32768” (invalid) if boiler is idle. # be valid from -100 to +200 and this value gets ignored. Just to update all of this for people that might read it in the future. I was able to get everything working using my Rasipcomm serial interface at /dev/ttyRPC0. (no TCP to RTU daemon necessary.) I had to download the sources, apply the patches and compile/install everything. Works very well. Now to figure out how I’m going to use the data. Thanks for all your help Eric and for doing the work on making this possible. I like your article. I’m currently trying to use the same Kedsum USB 485 device in a rpi to talk to a piece of equipment that wants 9600 Baud, 7 Bits, Even Parity, 1 Stop Bit. What I have found is that if I put the kedsum in my laptop, and apply those settings, I can talk to the equipment just fine, but when I put the kedsum in the rpi and use stty to configure it I just get garbage, even though stty will report that the settings were applied. Did you have to load your own driver to the rpi for the kedsum to work properly? I just plugged it in and it worked … how are you “talking” to it? Did you try my little ttstatus.c test program on the rpi? Device 004: ID 1a86:7523 QinHeng Electronics HL-340 USB-Serial adapter) Can you confirm that is the same dongle you have? Modbus plugin: Data block “supply-temp”: No type has been specified. Any help would be appreciated as I was planning on using this as my cornerstone of my home energy management system. As for the warning in tt-status.c, that’s just supposed to throw a compile-time error; it was a warming to myself to fix that later. I’ll send you an email, and see if I can help you get things sorted. I am having the same error, did anyone have any insight? Modbus plugin: Data block “flue-temp”: No type has been specified. I get the same two errors for a few data blocks (but not all). I’ve tried “RegisterCmd ReadInput” and “ModbusRegisterType input”, but there was no change. running tt-status.c gives expected results, without errors. also Eric, thank you for all your work here. This is great! Hi Ben – I really should update this post now that all the modbus stuff is merged in current upstream collectd. I’ll send you an email, and when we get it sorted properly I’ll drop another comment here & update the post as needed. After a year, we’ve been able to get this up and running. The fix seems to be the 3rd dongle I ordered (reports the same as the 1st). I’ve also implemented wunderground data using collectd’s curl-json to more accurately report temperature as the outdoor sensor that came with my boiler is always 5-10 degrees high. I’m diving in! I have a Lochinvar KH and just ordered a Pi. Awesome! Please let me know how it goes. The Lochinvar almost certainly has different modbus addressing etc, but it seems well documented. Drop me a note if I can help. Since I already have a NAS box, can I use it, instead of a Raspberry Pi? Of course – let me know how it goes! hi Eric. Little late to the game but I’m about to try this out. I have a Lochinvar KHN110 boiler and got the usb adapter and rasberry from amazon. What flavor if rasberry are you running? It’s pretty old, TBH. :) I’d maybe start by modifying my little tt-status to try to talk to the Lochinvar if you’re able to do so. Did you find documentation on the Lochinvar modbus map? I’d be happy to help modify my little C program to test communication if you need a hand, then once you know that’s all good, can work on the ongoing monitoring side of things. The Lochinvar docs seem straightforward. edit: still can’t tell from the manuals if it has modbus built in or not. If it does, you might need to dig through menus to enable it, or to find/set the modbus slave ID. Its a bit confusing. I looked at the install manual and schematic for pins 45,46,47 are labeled MODBUS. Here is a screen capture. But it seems that all the settings and controls are on the modbus control module that is optional. It has dipswitches for addresses and other options. So I think modbus pins from the low voltage control board connect to the module and then usb adapter that you use connects to the modbus board. If thats the case then i can’t do much without the board. I’ll try to research it tomorrow. Hi Eric. I contacted Lochinvar and they confirmed that I do need the board for modbus to work. I placed an order today, should have it mid December. Will update you when it comes in. Thanks for the update. Hope it wasn’t too expensive! What was the part number for the MODBUS board from Lochinvar? Would like to do the same! What lochinvar do you have? Hopefully this will be a place to start, and we can fix it up to get out the values that you care about. (In reality, I’m still using collectd to gather my daily stats, but the test program will be nice to figure out what’s where). Hello. I got the modbus board installed. Got the laptop and made a rs485 cable. Connected A on the usb adapter to port 46 on the lochinvar board and B to port 47. Downloaded WinbusMod software. Configured it for com5, 9600 baud, no parity 2 stop bits. Software says port open. Am I suppose to see any activity? First time using modbus so I’m pretty new to this. Boiler is currently not running and in standby. Got raspberry up and running. Hi Eric, I have to say thanks for publishing this info. My goal is to take this info one more step by allowing a text or email if boiler goes off on alarm. However I have one question. All info reported thru modbus is accurate accept for the supply and return temps. The supply temp is alway 10-15 degrees lower than what the boiler indicates and the return temp is usually 2-3 degrees off. Have you run into this scenario? Weird, no, I have not noticed that – you’ve set this up and observed a difference between what modbus says and what the boiler screen says? I’ll have to double check mine. Not sure if you are still checking this page, or if you are still working on this project, but I could use some help if you are interested. I just purchased and installed a Glenwood pellet boiler (locally made near me). The controller is a Love Controls 32B63 that uses modbus over RS-485. I was able to get your program running on a Pi 3 using a JBtek USB adapter (https://www.amazon.com/JBtek-Converter-Adapter-ch340T-Supported/dp/B00NKAJGZM/ref=sr_1_15?ie=UTF8&qid=1548033969&sr=8-15&keywords=usb+rs-485). When running, it would fail at “Modbus read of 1 byte at add 0 failed”. I commented that out, and then it failed at the next one “of 9 bytes at add 0x300…”. Again, I commented that out, and I started to see some results. However, none of the results make sense. I played around with it a bit more, but couldn’t figure out how to translate the address fields from the Love Controls data sheet into the code. Page 24 has the modbus info on it. The modbus map is unique to the device, so the program as written for my boiler is unlikely to give you any meaningful results for your device. Page 24 of the PDF you linked to contains the registers, their sizes, and their meanings. Hopefully some of that is what you’re after; 0x1001 seems to be the setpoint, for example. You’d just need to change the program to read different registers, and present them with the units or descriptions that are associated with them. Thank you so much for your fast reply. I’m a complete noob when it comes to programing a Pi, so I’m trying to wrap my head around how to change the address info. I found a Modbus tutorial, so I am going to go through that and see if I can get it working. I was able to successfully connect with a PC using the USB-RS-485 adapter running the Dwyer software, so I found the communications settings using that. I’ll keep you updated with what I find out, and can post the code changes if anyone else is interested in it. thanks for dealing with collectd and modbus. I’m trying to collect data from several k-type thermocouples connected to an ICP DAS M-7019R modbus analog-to-digital module(https://www.icpdas-usa.com/documents/userManual-M-7019R.pdf page 153). When I’m using the qModMaster (a Master GUI) program I’m able to communicate with the device, taking the devices slave address 1, the function code 0x04, the start address 0 and the number of coils to read 1 or up to 8. So the basic setup with my USB/RS485 converter is working.. but the collectd configuration file is confusing me. I don’t get where to define for an example the slave address of my device. Is this defined by the “1” in ‘Slave 1’ ?? What RegisterCmd is for is obvious, but then again RegisterBase is not..
Can you please give me a hint on how it works? I tried to get a hint by looking at the source code, but I think I’m too inexperienced in C++ to learn anything from it. Thanks a lot! Sorry for the late reply. The best reference for the modbus plugins is still the big collectd.conf man page, though perhaps you already found that. Yes, “Slave X” should be the modbus device address.